To get the most out of every effort you exert in a sport, you need to wear the right type of shoes that will boost your performance. This is why for tennis enthusiasts out there, it is important to choose great quality footwear suitable for your needs. 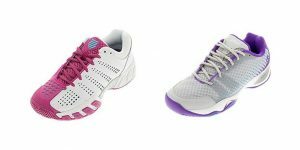 In these best women tennis shoes in 2019 reviews, we present to you 10 of our top picks that we believe can give you the perfect fit, support, and comfort as you head towards your game. When choosing tennis shoes, cushioning is an important aspect to look into considering the quick movements you make as you play. The soles should offer maximum stability and traction to prevent you from losing your balance. Also, mesh material or any type of breathable fabric for the upper is ideal since this allows your feet to breathe the whole time you have your shoes on. If you have specific foot conditions, you may want to look into particular features of the shoe that will address your needs. 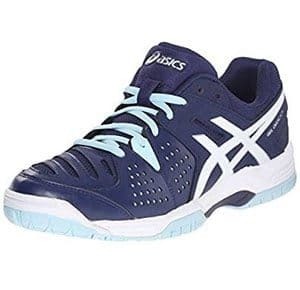 The following products in our best women tennis shoes in 2019 reviews are among the ones that have caught our attention because of their impressive features. Learn about these items and weigh the pros and cons of each as presented below. It may only be the brand’s entry level in its tennis shoe line, but you can expect satisfaction from what the footwear offers. It is designed with the GEL-Dedicate 4, Asics’ brilliant technology that promotes stability and comfort at the same time. These features include the midfoot Trusstic and the forefoot GEL cushioning system, which are unique to Asics footwear. The outsoles are made from durable rubber for optimum traction while the upper is flexible and breathable enough to provide you with comfort throughout your game. We like how lightweight these shoes are, and it almost feels as though we are walking on air with every step. Take note of the narrow toe and forefoot area, though, which is why it is best to purchase a pair that is at least half a size bigger than your original size. Before you head out to the court, be sure to prepare yourself for the intensity of your game by wearing superior quality tennis shoes. 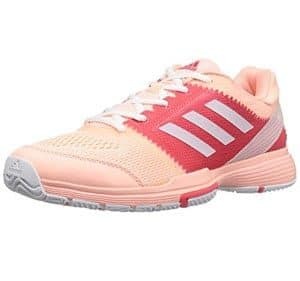 What we like about the Barricade Club tennis shoes for women by Adidas is the light feel of the footwear combined with well-ventilated uppers. There is also the Adituff, a unique feature from this brand, which eliminates drag whenever you are faced with tough matches. No matter how intense and crucial the rallies, you can maintain your stability, thanks to the EVA midsole and the 3D torsion midfoot of the shoe. These shoes have a true to size fit, which makes it easy to buy a pair that is not too loose or too tight on you. What’s more, the traction you can expect from the footwear is great, and it is easy to maintain your balance and flexibility. Just a few days to break these shoes in, and you should be able to feel very comfortable no matter how many hours you train or play. Nike is all about functionality and aesthetics – and this product is not an exception. It comes with a catchy design that is the brainchild of Tinker Hatfield, Nike’s designer, and Roger Federer. The upper comes with synthetic overlays for flexibility. It also features the Adaptive Fit system, so your feet remain in place for a secure and snug fit you want. Since impact is something that is inevitable in every game, we like the fact that there is the proprietary Nike Zoom Unit that keeps your feet protected the whole time. These shoes have taller sides that reach the ankle, and this adds support whenever you perform sudden lateral movements. Also, the cushioning is perfect – soft, but with a hint of firmness. However, we advise that you purchase a pair half a size smaller since these shoes run a tad large. 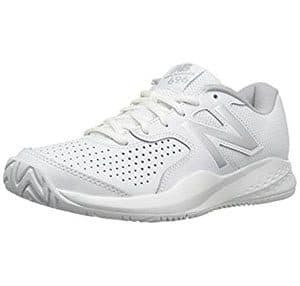 If you have been wanting to get better protection for your feet during your game, then this is exactly what you can get from the New Balance 696v3. It is the latest version from this model, so you can expect more improvements in terms of functionality and comfort. The outsole pattern has an updated and improved herringbone pattern, which contributes to better traction and stability. Sudden bursts of movement are no longer an issue during your game because these shoes got you covered – literally and figuratively. You will need to break these shoes in since they tend to be a little rigid right out of the box. However, after several wears, you should not have any problem anymore with the footwear. They are as comfortable as how you want your shoes to get, particularly when you have to wear them for your tennis matches or training. From the outside, you can say that these shoes are catchy. The purple and pink combo makes the footwear appear ultra feminine, which may appeal to most women. Looks aside, there are more things to appreciate about this product than what meets the eye. In fact, it is lightweight, so there is no drag with every movement. These shoes are also breathable, as the uppers are made from mesh for optimum ventilation. To help maintain your lateral stability, there are welded foot straps that keep every step you make secure and balanced. Unwanted twisting is also prevented from causing you injuries with the help of the TPU midfoot shank. We are impressed with these great-looking tennis shoes that are even much better in real life than in photos. These are comfortable to wear, plus there is a wide toe box to provide relief for those who suffer from bunions. 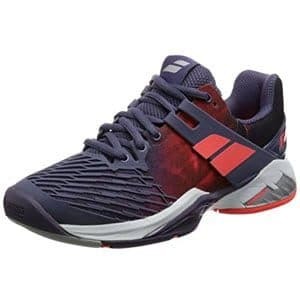 With advanced technologies incorporated to these shoes, the Babolat Jet AC offers the right amount of support and lightness to improve your performance in the game. There is Kevlar Fiber material for the upper, which adds to the maximum strength and durability of the footwear. It also features the polyamide fiber that protects the shoe from abrasion. These shoes boast of the impressive outsole system with S-shaped sculptures, and these help you adapt to tough and quick footwork whether it is forward, backward, or sideward. Plus, with Michelin rubber for the soles, traction is dependable at all times. The design and construction of these shoes are without a doubt excellent. However, the footwear tends to be a tad narrow and small for those who have wide feet. As for the length, though, there is no problem at all. Made from durable and solid textile for the upper, these shoes have sturdy and non-slip rubber outsole to keep your footing secure. 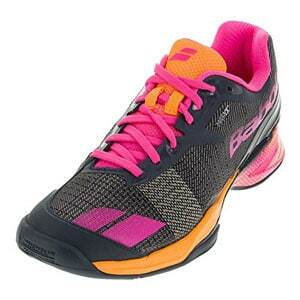 We like how lightweight these shoes are, which enhances the responsiveness and comfort with each stride and step. This Nike tennis shoe model provides a supportive fit, as well, as there is a padded tongue and collar that double up as cushion for the top foot. Stability is also guaranteed because of the well-designed midfoot shank incorporated to these shoes. We appreciate the high ankle cut that promotes an enhanced lateral stability. These shoes also have a breathable mesh material for the upper to provide ample ventilation and prevent the feet from getting too sweaty. Just keep in mind that these are a bit narrow shoes, so people with wide feet may have a problem getting the right fit they want. 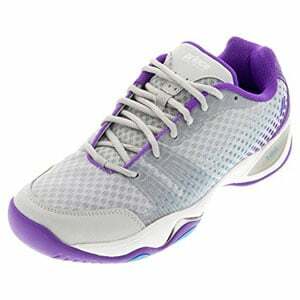 An improvement to the older models of women’s tennis shoe from K-Swiss, the Bigshot is without a doubt lighter, more comfortable, and faster. Lateral stability is enhanced as the shoe is designed to keep the feet much closer the ground instead of keeping them raised. Thus, you can boost your speed and agility throughout the game. The lining material adds comfort as it wicks away moisture, and there is a toe guard that prevents injury due to intense impact on the forefoot area. You can never go wrong with the Bigshot from K-Swiss. 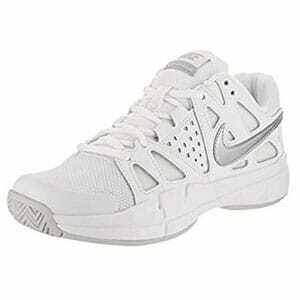 These are lightweight tennis shoes that are compatible with your custom orthotics. The toe box is also fairly roomy, so you won’t have to feel as though your toes are jammed to the front. Make every move as explosive as possible without causing any pain or discomfort to your feet. This is exactly what the Rush Evo offers, as it has the forefoot technology that improves stability. You can get maximum cushioning from these shoes because of the R-DST+ technology, along with the padded footbed. What we appreciate about these shoes is the durable and sturdy quality from the exterior to the interior lining and footbed. The outsole has a non-marking quality for any type of surface, and there is a breathable lining made from textile to keep your feet fresh and dry. If what you want is an enhanced overall stability and comfort for your feet, then the Propulse Fury from Babolat is your best bet. This comes with a roomy toe box for an enhanced comfort, along with the power belt construction that increases responsiveness. The material for the interior offers abrasion resistance while keeping the feet well-ventilated and dry. From the forefoot to the midfoot and heel, you can get the level of support you need to make the most out of your game. There are so many things that we like about these shoes, which ensure our comfort and protection no matter how tough the game may be. But keep in mind that these shoes tend to be a little narrow, so it is best to size up for a better and more snug fit you prefer. 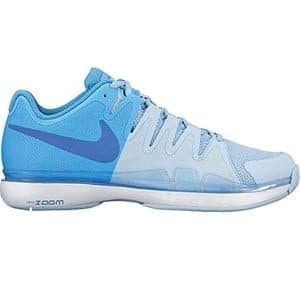 These are our best women tennis shoes in 2019 reviews that highlight our recommended products in this category. We hope we were able to help you make a choice on the right item to buy that will give you the comfort, fit, and support your want from a high-performance pair of tennis shoes. The shoes you wear have an effect on your overall sense of comfort and ease during the game. 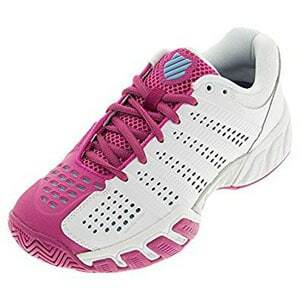 This is why if you’re in search of the best tennis shoes for women, we’re here to help you. We’ve gathered important features on what to look for in tennis shoes, so you know which product to pick out for your needs. Before you grab a good-looking pair of tennis shoes your eyes have laid on while at the store, think about your typical playing style. If you’re a baseline player, you’ll need shoes that offer lateral support with highly durable soles that can handle constant and intense lateral motion. On the other hand, volley players would need durable toecaps or reinforced toes since they tend to slide the back foot whenever they volley or serve. Depending on where you’re playing, you should make sure your shoes match the surface of the court. There are harder court surfaces that will require you to wear shoes with added cushioning while softer ground would need greater traction from your shoes. 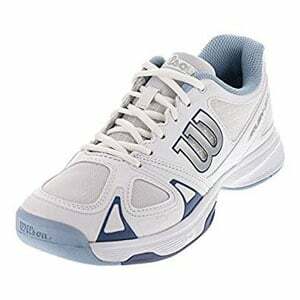 If you’re a hard court tennis player, opt for shoes with outsoles and uppers made from vinyl or leather. For clay or grass court, however, you may do well with extra grip and traction on the outsole with non-damaging features. Some people may not be aware of it, but feet come in different types. These include underpronation, overpronation, and neutral. Underpronated or supinated feet tend to roll outward with every stride. This is why you’ll need added flexibility for your shoes if you have this foot type for reduced shock issues. Overpronators will need stability tennis shoes for support whenever they roll the foot inward. If you have neutral feet, you can get away with any tennis shoe. Most importantly, you have to check how the shoes fit on you. There should be a little bit of a wiggle room inside, yet not too much that the shoe tends to fly off when you run. If you can still insert your pinky on the end of the shoe that touches the heel, then you’re good. Otherwise, you may either size up or size down to achieve better comfort from a properly-fitting pair of tennis shoes. Ready to head out to get yourself the best pair of tennis shoes? Make no mistake about your purchase as you keep our buying guide in mind as you shop for the right product you need.